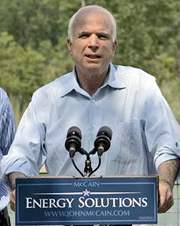 As recently as 2008, the Republican candidate for President (John McCain) supported Cap and Trade as a policy to ward off the effects of climate change. Newt Gingrich was on board with a host of green measures. In the UK, all three major parties recently signed an agreement paper recomitting the country to an aggressive program to lower emissions. On the other hand, Australia and Canada have walked away from previous commitments and the upcoming COP in Paris promises to deliver as much as previous COPs–precious little, in other words. How much does someone’s political beliefs affect their view on climate change? I suspect rather a lot. I think it’s probably because the major sources of information don’t limit themselves to climate change and if you don’t like what California Governor Jerry Brown (or his predecessor Arnold Schwarzenegger) say about economics, poverty and taxes you are not likely to appreciate their views on climate change. I just wrote sort of a position paper on the companion blog to 3000 Quads, The Lukewarmer’s Way. In it I describe my personal journey to the Lukewarmer status I claim today. Here I produce a quote from something I wrote on The Air Vent a couple of (wow–it was five years ago!) years ago to describe my political stance. I do this both to promote what I believe is right and to give readers with firm political views a chance to get a better picture of what I believe. Because I have no doubt that what I believe affects what I write. No claims to omniscient objectivity here. I want the state to lead the push for conversion to green technology, not because I think it will be more efficient than the market, but because I don’t believe the market is capable of sending the correct signals about what consumers will want in the future. There is no way of indicating future preferences in this sector. There is no price on carbon. There is no futures market on air quality. Etc., don’t mean to bore. I most emphatically do not believe that big government will do an efficient, laudable and forward-thinking job of this. They will get so many things wrong that we will all wonder why we let them even start. But it is only government that can get this going. Because this is a new market (I know, only partially so), there are rents to seek and laws to evade and scams to run, and we will see them all. It is my hope that big government will be able to minimize this and allow the market to come to fruition more efficiently. But even if it doesn’t, it is IMO only a big government that can kickstart this and create a framework for the construction of an energy portfolio that will enable us to transition away from oil and coal within the timeframe that is appropriate. Anthropogenic global warming may not be the overriding problem we are trying to solve. It may only be the poster child that motivated hordes of well-meaning greenies. OTOH, it may be a serious problem that requires serious attention and commitment of resources. I don’t think we’ll know for about 30 years. But even absent AGW as a primary motivating cause for action, pollution, depletion, energy independence and the pernicious effects of natural resource corruption on governments make it clear to me that having a diversified portfolio of energy resources, a distribution system that makes energy markets more efficient, and a physical plant that does not consume twice as much energy as needed for the tasks required, are eminently worth pursuing and justify asking national governments to assist with. It’s not as if this is the first time we’ve done this–conversion from wood to coal and from coal to oil offer plenty of case studies in policy success and failure. Maybe it’s just a bit humbling to think we have to dust off books about Rockefeller and the British Navy’s conversion to oil to remember how to get it right. I would submit that much of what will be remembered of the past century as improvements in the human condition will be the result of progressive liberal initiatives that were bitterly opposed by conservatives arguing much as they are here. What you will tend to remember are things like the U.N. What the rest of the world will remember are things like the Civil Rights Act, Social Security, Medicare, the G.I. Bill and other measures that made a huge difference in the lives of poor Americans. Peter Drucker himself said that the GI Bill was a transformative event in the history of America. Nobody discussing the failure of communism to spread through the industrial world has failed to note the effect of progressive measures in alleviating misery and providing hope to those who otherwise would have been candidates for support of Marxist theory. And indeed, those places with active communist movements are those without similar measures. Like the conservative woman in a news clip who declared ‘Keep the government’s hands off my Medicare’ conservatives forget the origins of programs they now value. I’ve never met a conservative who wanted to repeal the GI Bill. All conservative fury about Social Security is about its funding, not its existence. I don’t tie communism to relief for the poor. I tie it to human rights abuses, censorship, hunger and lack of proper fitting shoes. I tie it to visits to the dentist and getting my teeth drilled without anesthesia, to hauling water everyday after school, and to learning to keep my face expressionless when I listened to endless speeches about revolutionary accomplishments. I guess I’m an extreme case. I tie it to being insulted and disgraced by pro regime thugocrats, and by the red vermin I met outside after I escaped, which insisted in calling me worm and all sorts of insults. But this comes from personal experience. And I separate it from the global warming issue when I’m having serious discussions. At the same time I see the enviromental movement sure seems to be full of communists. It makes their message easy to turn off. I personally tie communism to the difficulties progressive liberal thought that I support face in moving forward. In that I am no different than a ‘sane’ scientist angry at alarmists for hyping climate change or ‘sane’ skeptics disturbed by Iron Sun theorists or Sky Dragoneers. But what communism took off the table is in my opinion more important than climate change. There was a coherent strategy for helping the poor and improving the lives of all within the framework of democratic society. And communism almost killed it. Tomas, thats a Most Excellent observation. But it is only government that can get this going. I don’t agree. I’m still working on how to articulate my thoughts in this area, but I would suggest that the reason people think only the government can do things like this is that, in the past few centuries, most of them appear to have been done by “governments”. I would point out that those “governments” were typically “national governments”, i.e. the formal governing bodies of “nation-states” which are endemic to, and pretty much unique to, Western Europe in the last few centuries and their colonial descendents and imitators. And those “nation-states” grew out of the collapse of the imperial “Roman Catholic” power (split Papacy, Reformation), and the social changes deriving from the introduction of the longbow, gunpowder, and mechanized power in warfare. Changes that would have been prevented by an imperial “Catholic Church” had it been able. IMO there are other options, they just don’t have any (recent) precedents. But notice how much the activity of governments to “get things going” tends to follow prior activity among a variety of non-governmental players. I’d describe them as being like mushrooms: by the time you see them (in the process), most of the real work has already been done. Non-reactoinary politicians are waking up and realizing that cap and trade and CO2 tax is nuts and never going to do anything about climate/weather (both terms regularly abused by the climate obsessed community) and will disrupt and damage economies. Those defending entrenched climate hype interests and big green are going to resist and reject calls for climate realism and treating people decently. Abandoning imperialism as the progressives tend to say should happen, has costs. I admit it.